These are healthy, quick, easy and delicious! And No-Cook! Adorable tasty morsels for after dinner with coffee! You can leave them plain or decorate them with fondant leaves and berries. They are also good without the chocolate coating! Place the chocolate in a food processor. Add the fruit, brown sugar, almonds, cocoa, coconut, vanilla, spices and brandy. Process until a sticky paste forms. Using slightly wet hands, roll into small balls. Roll lightly in a little cocoa powder so they will not be too sticky. Place in a container, lined with baking paper, cover and refrigerate until firm. 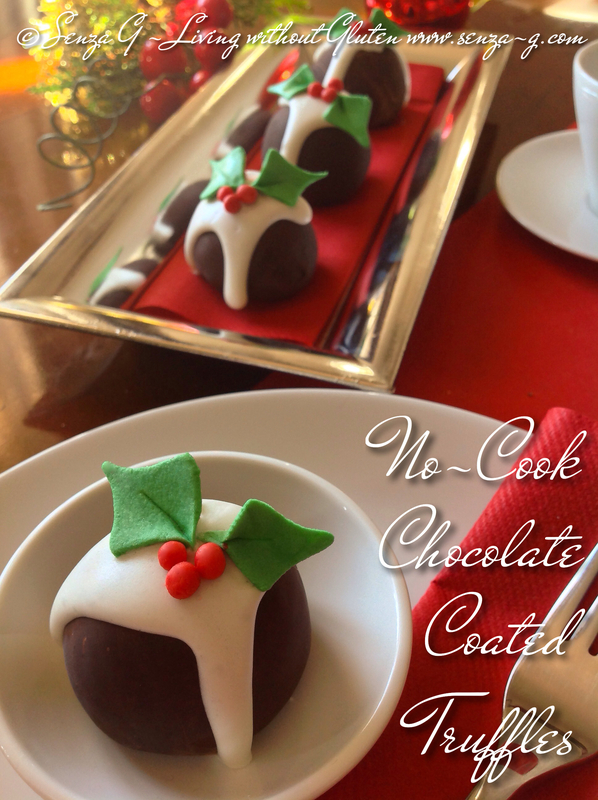 Melt the extra dark chocolate and dip the balls to coat evenly. A great way of doing this is to use short bamboo skewers. Stick a skewer in the ball, dip in the chocolate to cover, leave to drip and then place it, skewer and all in a mug till the chocolate sets. Once the chocolate is completely dry, remove the skewers and place the balls on a baking sheet. Melt the white chocolate, put a teaspoonful of top and before it sets, decorate with berries and holly leaves made out of fondant.